Remodelaholic put out the call and I thought it would be fun to participate in her structural lumber feature week called 2×4 and more. 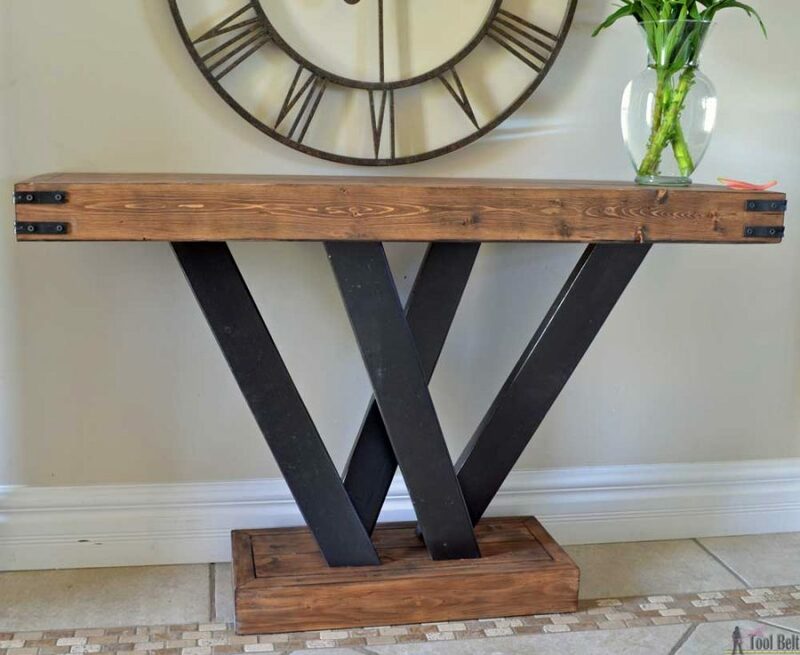 A while back I saw this Modera style console table and wanted to try those funky legs. It was the perfect piece to build out of all 2×4’s and easy too. What do you think of that style? I think the console table legs could stand to be a little chunkier, but no matter what angle you look, they look different. Most of the finishing supplies I had left over from other projects, the wood and braces totaled to about $25. 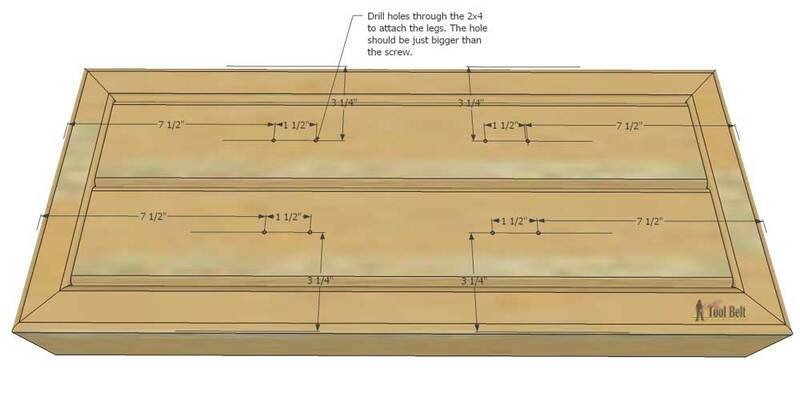 Drill pocket holes for 1 1/2″ material in the 45″ 2×4 pieces. Drill pocket holes to join the 3 boards together and also around the edges to secure the sides on later. 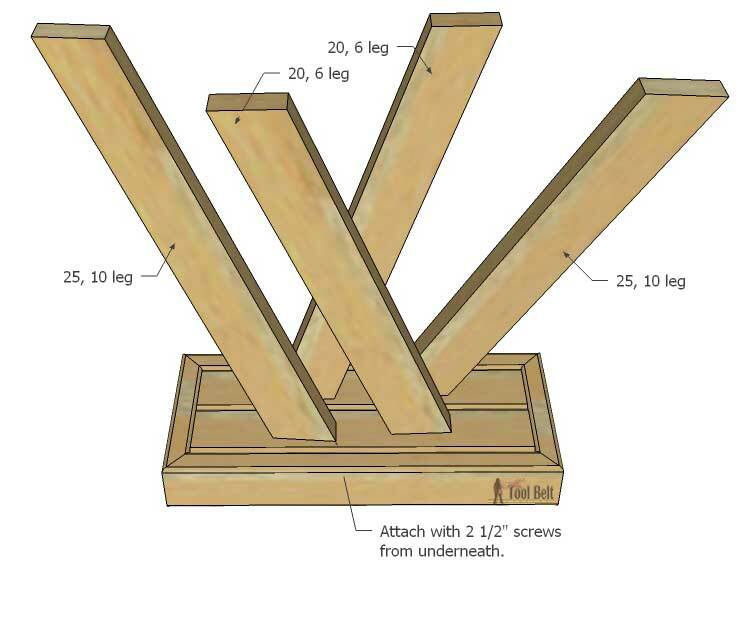 Use wood glue and 2 1/2″ pocket hole screws to join the 3 – 45″ together. 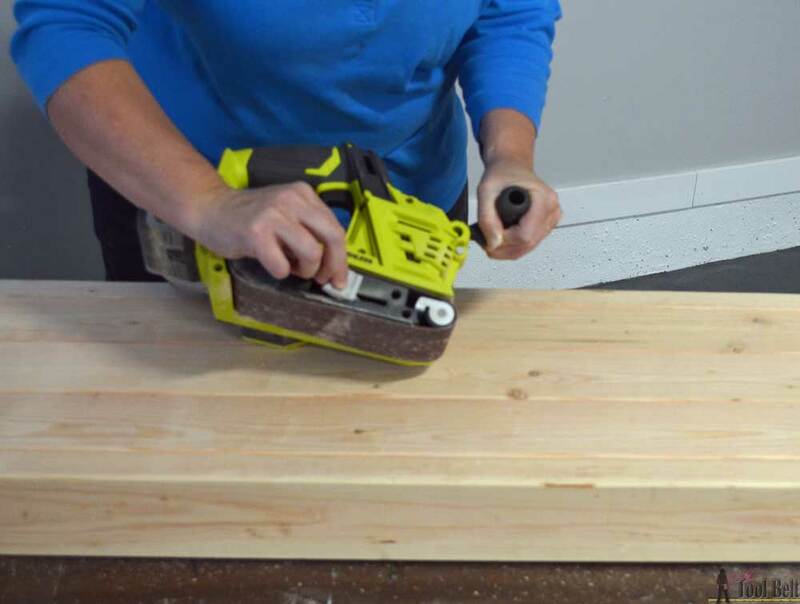 Cut the two 48″ pieces and 13 1/2″ pieces to fit around the 45″ boards. Put the 45″ boards top down and secure the 48″ and 13 1/2″ side boards on with wood glue and 2 1/2″ pocket hole screws. The tops of the side pieces and the 45″ pieces should all be flush. Drill pocket holes for 1 1/2″ material in the 21″ 2×4 pieces. Drill pocket holes to join the 2 boards together and also around the edges to secure the sides on later. 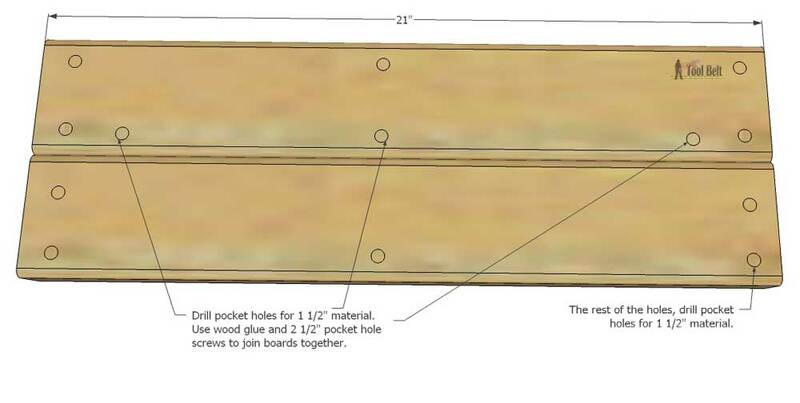 Use wood glue and 2 1/2″ pocket hole screws to join the 21″ boards together. Cut the two 24″ pieces and 10″ pieces to fit around the 21″ boards. Put the 21″ boards top down and secure the 24″ and 10″ side boards on with wood glue and 2 1/2″ pocket hole screws. The tops of the side pieces and the 21″ pieces should all be flush. Sand the top and bottom pieces for convenience before putting the legs on. 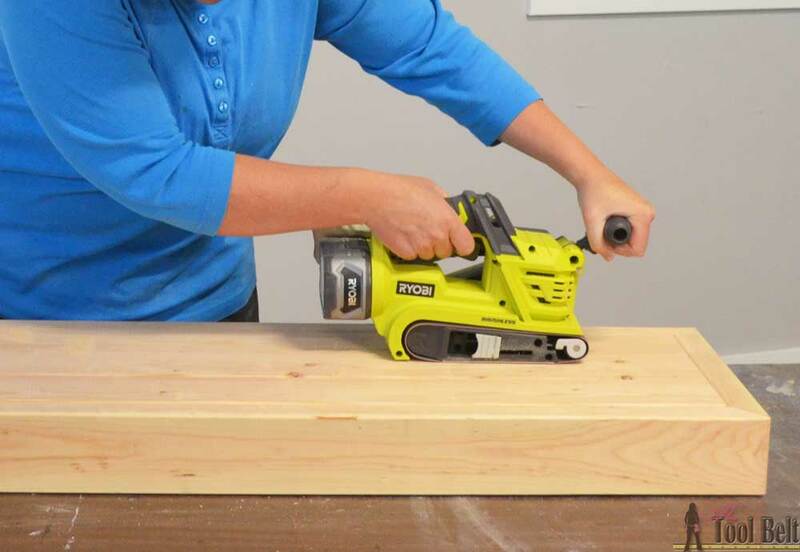 I’m reviewing the new Ryobi 18V brushless belt sander. When building with structural lumber, you can really save yourself some time using a belt sander to get those boards flat. Going cordless is a little bit frivolous, but it sure is sooo nice and convenient. I only have a few plugs in my garage, I really like grabbing my cordless tools so I don’t have to drag the extension cord everywhere. This belt sander is super easy to use, but you’ll need to make sure all of your batteries are charged up, because you’ll go through them. It’s a great tool for small to medium builds and doesn’t make you feel like it’s running away with you. There’s also a trigger lock, so you don’t have to hold the trigger down the whole time! Move the pommel handle by pressing the button and rotating it up or down, so it’s comfortable for you. If you need to change the belt, loosen the tension and pull the side lever and that’s it. Belt sanders are made to remove a lot of material, so the grit is usually pretty rough and will leave scratches. If you’re going to stain your table, then follow it up with 120 or finer grit paper with your regular sander. Sand in the direction of the wood grain. For this finish, I rubbed a light coat of golden oak stain onto the top and bottoms. I used a chip brush and dry brushed (put a little amount of stain on the brush and dab off onto a paper towel) the Kona sparingly onto the top and bottom, focusing mostly on the edges. Drill thru holes in the base for the legs. The hole diameter should be just large enough to fit the screw through. 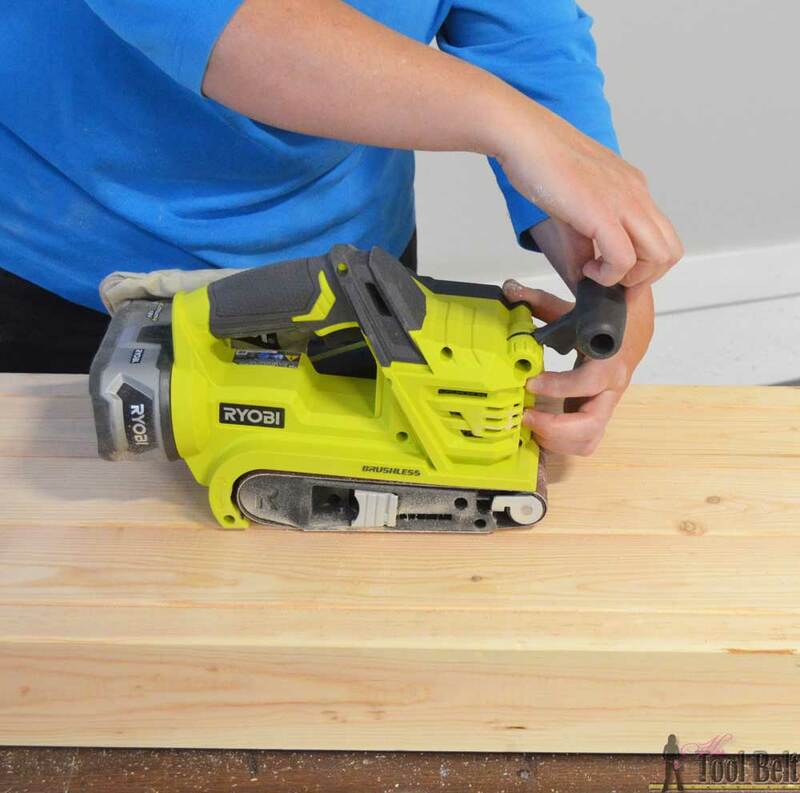 Drill 2 holes per leg about 3 1/4″ from the long side and 7 1/2″ & 9″ from the short side. Mark the outside corner location for each leg. Inspect your legs and decide which one is going where. The 25/10’s will angle outward and go from front/back. The 20/6’s will angle inwards and stay either front or back. Drill pocket holes in the tops of the legs on the BACKSIDE. Tip for ORB legs – Sand the legs smooth and apply paint primer, let dry. Lightly sand the dry primer and spray evenly with Oil Rubbed Bronze spray paint and let dry. Spray the corner braces now too. 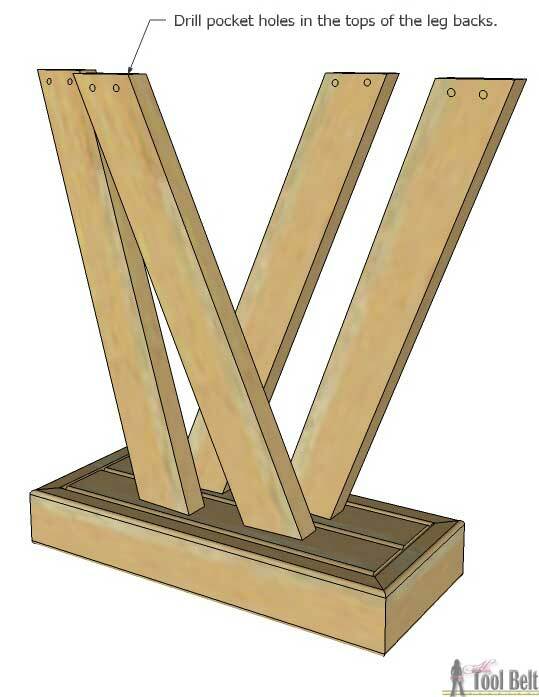 From under the base, attach each leg with a 2 1/2″ screw. Then place the top over the legs and secure the legs with 2 1/2″ pocket hole screws. Front view of the console table. 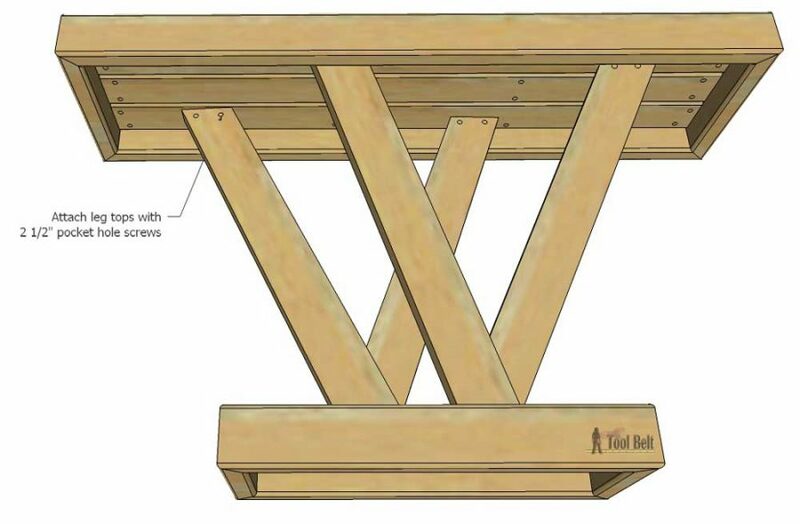 Thanks for pinning the 2×4 console table. 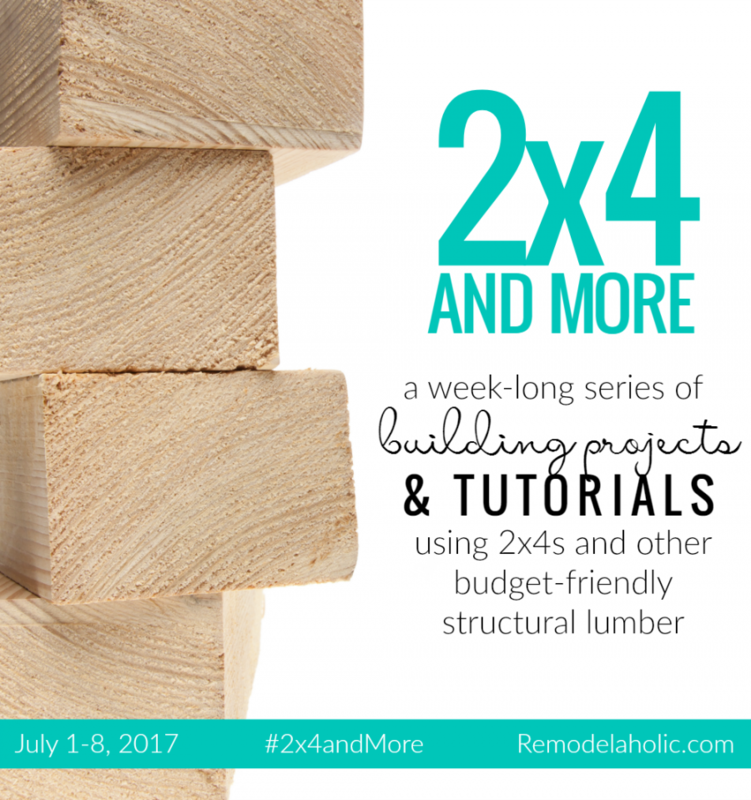 You can check out lots of structural lumber builds at the 2×4 and more feature week hosted by Remodelaholic. As always, your design is gorgeous and you don’t leave out a single detail! I love the look of black mixed with stain. 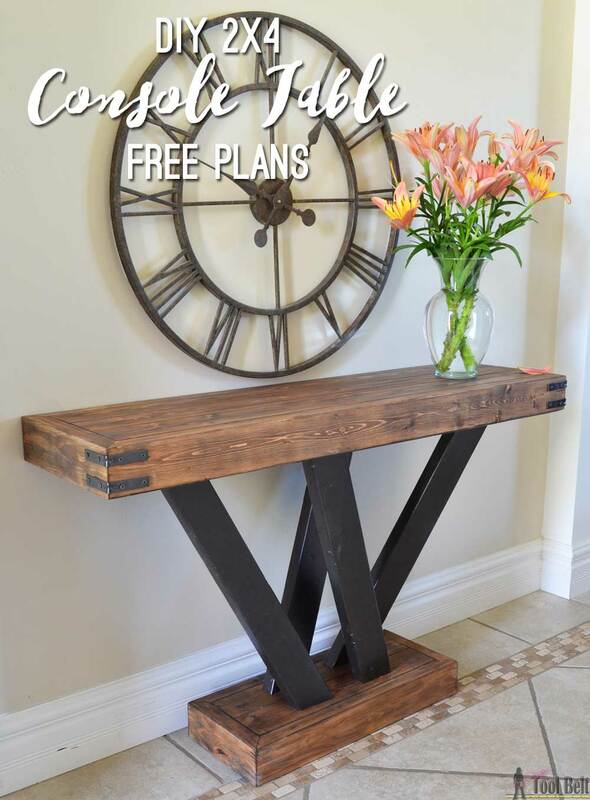 This turned out super cool and would be the perfect entry table! Oh my gosh… all those angles are SO intimidating to me! :0 One day, I’ll just have to bite the bullet and try! (I can barely manage a 90 degree one… ) Ha! I love it! Seriously such a cool design! I love the black on the legs – they look metal at first glance :). Great job! What color did you paint the walls? I love the look! Hi Sheryl the walls are botany beige. Hello – I love the clock. Have been looking for a similar one but everything seems so flimsy. This one looks like it has substance. Can you tell me where I can find it? Many thanks. This is such a creative design for a console table! 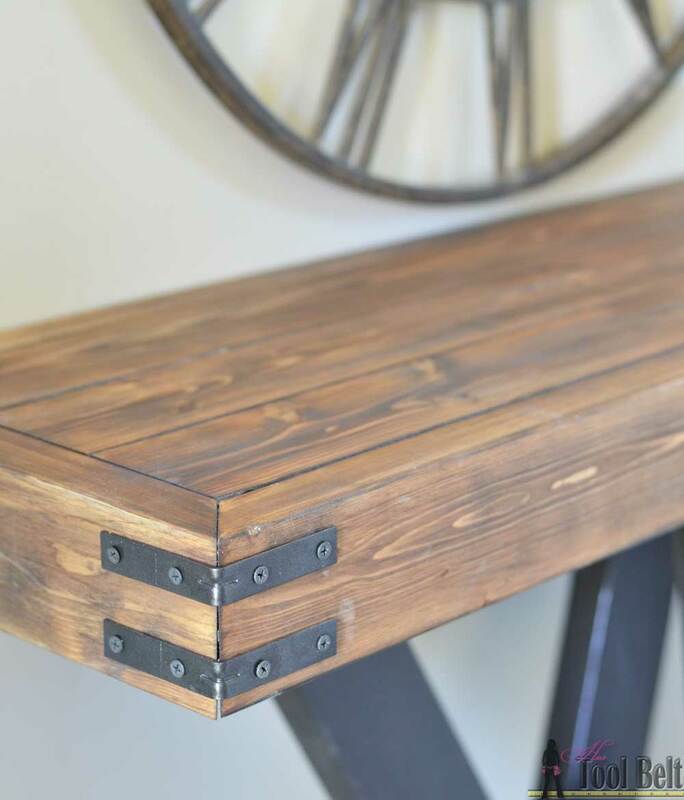 I especially love the brackets around the top – adds an industrial flair! Great Job! 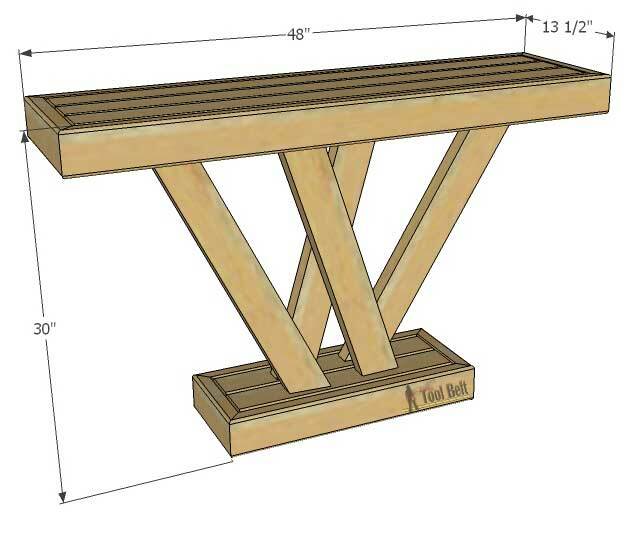 Would using 2×6 for the legs necessarily require an adjustment for the leg screw hole locations on the bottom stand? Also wouldn’t pocket holes be stronger for the legs rather than putting screws through the cut ends of the legs through the bottom stand? I really like the look of the table. This is a great looking table. I really want to make, soon. You used 2×4 that are “normal”, so the corners are rounded off. 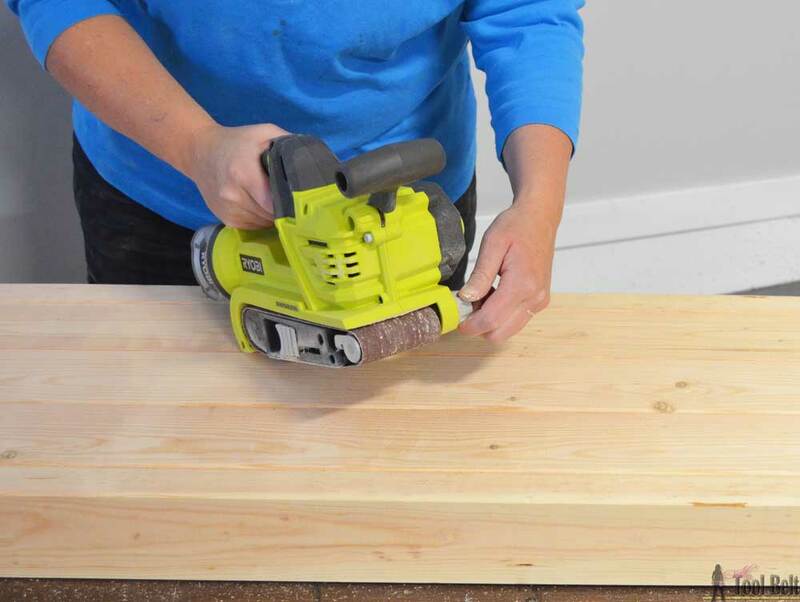 I don’t have a table saw but I was thinking that since Home Depot will do cut for you, I could have them trim the edges so the boards are square. This would make the table totally flat. Just curious if you think that is a good idea or a bad idea? Does the way you did it, add to the rustic vibe? I think your idea is great if you want it to be flat. However I know HD can cut boards, but I’m not sure if they can rip them to get rid of the rounded edges. Worth asking though. You can probably rip the edges off with a circular saw and a straight edge if the HD can’t.